I can’t tell you how many times I’ve heard someone tell me that budgets only work for people who have money to budget. Most often the moment I hear that I know I’m in for a long conversation about life and how it all went wrong and it’s the worlds fault that they can’t balance their wants and needs on whatever income they have. I’m not talking about homeless people who have no money coming in unless a stranger walking by spares them a few dollars rather I’m talking about the people who do have dollars coming in month after month. In fact I bet there are some homeless people who are better at saving or even sharing what they have with others because they know they have to make it stretch or last until the next time, if there is a next time. Not harsh at all, just reality. It’s a reality that some people will never understand unless they live it and there are some of you who DO have a roof over their heads, income and means to spend less BUT opt for making excuses over making money work for you. No, you don’t NEED to live in the most expensive city on the planet if you can’t find a job. The hardest part about being homeless is getting back up again in hopes of finding a place to live and someone to give them a job. I watched a video yesterday about a city in Fort Worth, Texas who is hiring homeless people in their community to help clean it up and paying them to do it. This is called the Clean Slate program and they not only do the job right they OWN the job. Helping others means inspiring them and giving opportunities to those who WANT to become financially independent. “Once you get an area cleaned up it’s a little bit rewarding”, Frank a worker in the program says in the video and the same can be applied to your financial life. Clean it up little by little and the rewards will come. We as a whole have to start OWNING our money and taking back the control we’ve simply given away because we believe we WANT more than we NEED. Do you know what it’s like to be homeless with no food or having to roam the streets looking for government services to help in any way, shape or form. If you haven’t then you can’t say that you don’t have money to budget because when you have any money you have money to budget. The Canadian government will provide more money with fewer restrictions with the goal of helping cities reduce homelessness by half over the next decade. A research paper from 2016 found that at least 235,000 people in Canada experience homelessness in a year and 35,000 are homeless on a given night. The word budget doesn’t mean you have to make x amount of dollars before you can distribute that money into categories that help sustain your life for today and tomorrow. It means that if you have a dollar and you have 4 things to pay for then you divide that dollar between all 4 things based on needs. One category might need $0.40, another $0.10 and so on until the dollar is used up. One of those categories might be savings and you may only have a dime left to put into it BUT that’s what YOU need to do in order to start building wealth. It’s time to cut the crap and get down to business because I don’t know if you noticed but gas prices, grocery prices, housing costs and just about everything around us is going up and not slowing down any time soon. You don’t just wake up in the morning and say, today, I’m going to be homeless. Being homeless often is not a choice but there are choices and sometimes we make the wrong choices that land us in places we’d rather not be. There are ways out and plenty of community organizations who ARE willing to help IF you are willing to listen and participate. You might be here reading this blog because you want help with budgeting because you may or may not have made wise decisions with your money or simply want to do the right thing from the start. I don’t know that’s your thing but my thing is to tell you that there is hope and there is a way out IF you are willing to take steps which most often include change. If you aren’t ready to change your life won’t change. There’s no way around that. When we do have the means to make decisions that can either increase our wealth by even a dollar we’ve taken one step from outside in where we want to be. No one wants to be on the streets, no one wants to be broke but we all need to live which means we all need to live differently if you want to survive in this crazy world. I always remember the story Mrs. CBB told me about when she was in college and how she plowed through $7000 worth of OSAP and by the end of the year she was picking up cigarette butts off the streets. As disgusting as that sounds when we become desperate for something we do whatever it takes to get what we want. The problem is we need to use this desperate mentality when we do have something to get us to the next level. Stop waiting until it’s too late and your only option, do it now, like right now. She went from being a frugal saver living at home with her parents to an out of control spender just to fit in with her college buddies. When school was done for the day it was off to the house to get ready for dinner and a night out at the club. If you’re a student or have been a student many of you know exactly what I’m talking about. There was some sort of mentality switch that happened when she left home which she can’t explain but knows she never wants to experience ever again. She had no food in her cupboards, no money in her bank account and was calling her grandmother begging for money. That never came without an argument either but always excuses made because she became stuck in this circle of staying out late, getting up late and too tired to care. She had no job as she couldn’t find one in the big city even though she was handing out resumes. Obviously quitting smoking would have been the ideal solution here but as an ex-smoker I know that’s easier said then done BUT possible. It took her 15 years from that time to quit smoking and you don’t have to be math smart to know how much money she spent and could have saved if she had just quit during those desperate times. She very well could have said enough is enough and gave it up, but she didn’t. My point is looking back won’t bring us wealth but it can bring us experience and knowledge to pass on to others and to improve our lives today. Perhaps you might learn from someone else’s mistakes so you don’t make your own but eventually we all have mistakes to share with someone else who hasn’t made them yet. After taking in a boarder for two months to help pay some of the rent it still wasn’t enough without having to go on welfare. It was then everything had taking its toll on her and she had to leave the big city to return home to her parents and where she started over. When she arrived home she was saddened to find her parents were suffering financially beyond repair due to illness and had to watch their walls crumble. She also felt guilty for all the money she used or had her parents spend on her when she was in need at college instead of trying harder to find work. She rented a small apartment and collected welfare until she found not one but 3 jobs, started working out every day, walked everywhere and saved as much as she could. Going out with her friends only happened when she wasn’t busy working on her life doing things that made her happy. Hanging out with her friends at the gym was far more satisfying than going out drinking for a night. Still to this day she is friends with her 90’s gym buddies and she credits her determination in the gym to becoming stronger in helping her to reach her goals in life financially, personally and spiritually. Not only did she go on to win two competitions in her home-town she learned that if you want something bad enough you have to push and push hard to get it. You have to do it day in and day out as it becomes a part of your daily routine. Budgeting works the same way. If you don’t make it part of your life it will NEVER work. 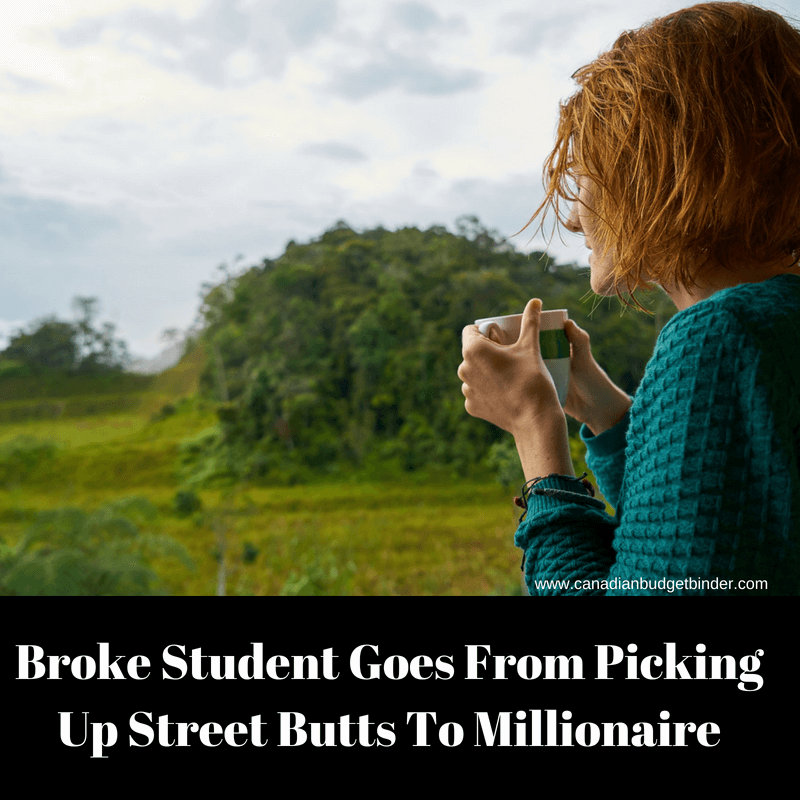 Her journey to becoming a millionaire had begun and those few short months of street picking and going without in the big city prompted her to make sure that money she did earn always had surplus sitting in the bank. Back then that was her emergency savings and as she got older and new jobs came her way she began investing in RRSP’s and TFSA’s along with a works pension she still holds today. She continued to be this saver until we met and of course pooled our money (she had far more than I did) and began our journey here at Canadian Budget Binder using a budget. We’ve learned lots over the years about finance but the one thing I know for sure is that no one can tell me that they can’t budget because they have no money to budget. Just this past month we’ve surpassed our goal of becoming millionaire but to be honest that really wasn’t what set us free. It was when we became debt free including our mortgage that we knew that everything we had done in our lives and the sacrifices we had to make were all worth it. In that time we’ve also realized that we are happy with what we have which is not a big brand new house filled with stuff we don’t need. It’s perfectly fine to have blankets and pillowcases that don’t match and who cares if your carpet has a few stains or your tiles are broken. Being comfortable and happy financially for us means sitting on our front porch in the morning with a cup of coffee listening to the birds chirp. The sounds of nature increases wealth in our hearts and mind knowing that we appreciate the small things that many others miss as they fly by life in a hurry. We still shop at Value Village for just about everything from clothing, books, toys, sports equipment and so on. Everything we do with our lives still revolves around budgeting because that’s the routine we set in our life and we know works. The moment you stop doing something is when everything can crumble unless you have a solid back-up plan. When it comes to budgeting the only back-up plan you need is to not back up, keep going. So the next time someone tells me they don’t have enough money or make enough money to budget I will tell them they have choices and to run along and make them but don’t turn back and cry about them. Discussion: What sacrifices do you or did you make in order to get where you are today? Do you continue to make sacrifices even though you are debt free? What advice would you give to others? As with a lot of people, I have experienced the highs and lows of a financial roller coaster, been dead broke & without food a couple of times in my life and it made me want to always have some funds in reserve for emergencies. I don’t get folks that won’t, and I don’t mean can’t, save even $1 per month and start their emergency fund. It’s not going to make you rich in a hurry but if you save $1 a month starting at you 16th birthday & your first job…20 years later there is $240 plus interest and that my friends will keep you alive with food for quite some time if need be. I have learned though, you can’t help those that refuse to help themselves and I have quit trying. We need to get back to real love…the long enduring and unconditional kind. To get there we need to abandon the “instant” everything mentality and the “me-me-me” motivation. My father asked me on my wedding day if I loved my husband enough to put him and his happiness first in my life ALWAYS. Dad said that if we both approached our marriage with that motivation, ours would be long and happy one and it has been! Never did Dad promise we’d be rich or famous…just happy and together as a team. That’s not that our life has been without financial hurdles – we’ve sure had our share. When was the last time you did without something so that someone else could have a little more? I believe what goes around comes around and I try to restrict my desire for non-necessities and instead just focus the sheer joy of sharing whatever is available with my chosen partner – I am one lucky lady and really want for nothing!